Latisha please email me your address and I will get your goodies out to you! What Caught Our Eye this Week! 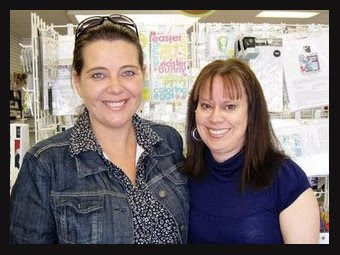 The two met at a local scrapbooking store they shopped, chatted and even had time for pictures! Cheryl was so super sweet she even brought Kazan and I a little gift to say thank you for all the inspiration! Thank You Cheryl you are such a inspiration to all of us too! Kazan and I between the two of us travel quite a bit so if we are ever in your neck of the wood just email us and maybe we can meet you! Next week will be a fun one at 2S4Y you wont want to miss it! Laura & Your Fantabulous Design Team! Congratulations to Latisha. Your card was absolutely beautiful. I loved the flower. Congratulations to the Fab5 too. Congratulations Latisha on being the card of the week.....loved your card. Congratulations to the Top 5...each of your cards was unique, fun & beautiful....well deserved!! And look at Mrs. Kazan & Cheryl....wish I could have joined ya'll. The fab 5 had super Fabby cards!! Congrats Latisha to your Card of the Week. It caught my eye as well and really love the colors and the stamp. 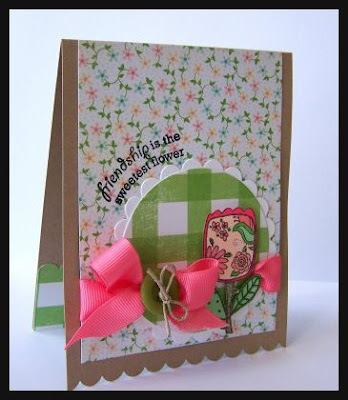 Gorgeous card Latisha! Congrats! Beautiful work Fab 5! I can't even begin to say how much I enjoyed meeting Kazan! ... Wow I'm in the fab 5 again can't believe it....Thanks girls!! Congratulations to Latisha !! Your card is sooo beautiful !! And the FAB5 did a wonderful job too. And to all of you: don't miss the next challenge , it's fantastic !!! Congratulations to all the winners!!! So jealous that Kazan and Cheryl got to meet!!! Congrats Latisha! Your card is AMAZING!! And congrats to the awesome Fab 5 too. Yea to you! Congrats to Latisha and the FAB 5!! Great great choice! I LOVE Latisha's card!!!! The fab 5 are awesome too!! Congrats you all!! Congratulation to Latisha your card rocks. And ofcourse to the FAB5 lovely cards.